On December 13th, three supporters of the Shut Down H&K campaign took flyers to offer to people arriving for the Sunday morning service at Trent Vineyard, seeking to raise awareness about the arms company and find common ground with worshippers just a fortnight before the birthday of the Prince of Peace. The campaigners began leafleting at the entrance to the church itself. The early arrivals were generally pleased to accept leaflets and surprised to hear that the world’s second-largest manufacturer of assault rifles and submachine guns was right next door. It was clearly not common knowledge among the congregation. After about 10 minutes a representative of the church came to speak to the campaigners. She said that although she wasn’t unsympathetic to the cause, the campaigners should not be on church property. Handing out leaflets at the door might give churchgoers the impression that they were endorsed by the church when they were not. Another church staffer then came out and took over the discussion. He said that campaigners had already been told (on a similar leafleting mission in January) that the church does not want leafleting on its property, and that their return demonstrated that either the campaign was untrustworthy or that its supporters were uncoordinated “loose cannons”. He continued that while the church would be pleased to see H&K go, it could not be seen to endorse the campaign as this could violate the church’s tenancy agreement (with car insurance company LV=) and could lead to losing its premises. He said that the church’s researcher had checked and found inaccuracies with the campaign literature, causing them to question the validity of the leaflets; another reason for not wishing to be associated with them or the campaign. The “inaccuracies” in question were not discussed, but the campaign will be writing to the church to seek clarification. He felt it would have been polite for the campaign to have contacted the church earlier, to seek support in engaging with the congregation. In fact, the campaign has tried to do that several times. In May 2008 a member of the congregation repeatedly sought an audience with the pastor on behalf of the campaign, and in May 2009 the campaign wrote to the church. No reply was ever received. 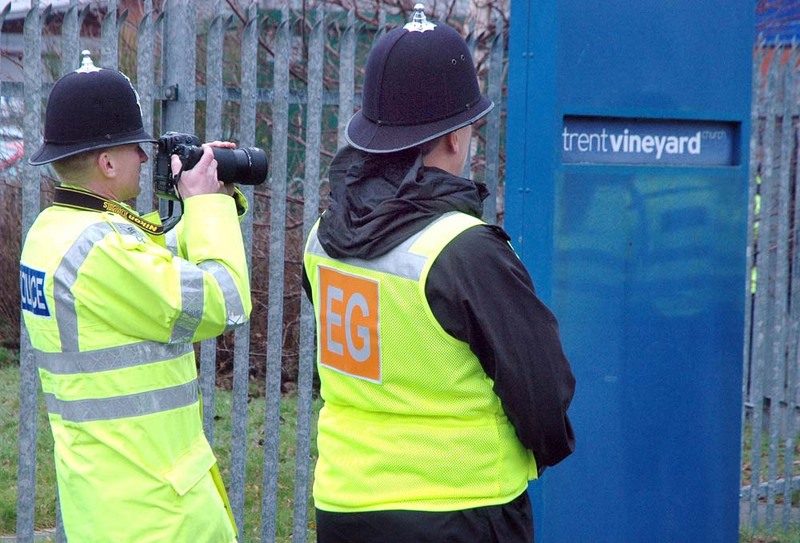 Police filming protesters near Trent Vineyard, Jan 2009. The pastor has asked police to prevent anti-arms-trade banners from being tied to the church railings. Whilst the conversation was civil, the staffer suggested that the campaigners were “hijacking” the church’s congregation and his time, which should have been spent with Sabbath arrangements and engaging with the congregation. A Sunday service was not the time and place for this kind of activity, he said. 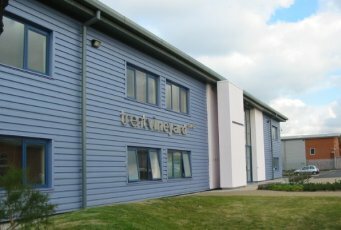 The campaign regrets the lack of trust between itself and the leadership of the Trent Vineyard church. However, the campaign believes that the congregation of the church has a right to know that the church is next-door to a controversial arms company with an indisputable history of supplying guns that have fuelled conflict around the world. Shut Down H&K strives for accuracy in all of its claims, relying only on authoritative sources and cross-checking its research with arms trade experts in the UK and Germany. If any of the campaign’s claims are shown to be inaccurate, they will be corrected immediately. Although Trent Vineyard did not respond to Shut Down H&K’s requests for a meeting, the campaign has been told by a churchgoer that Vineyard leadership has been in conversation with Heckler & Koch. The campaign urges the church not to accept assurances from the arms company on face value, and remains willing to meet with church representatives at any time. Shut Down H&K has responded to Trent Vineyard’s claim of “inaccuracies” in the campaign’s literature. What follows is a copy of a letter and e-mail that has been sent to the church to defend the campaign’s claims and ask for clarification. 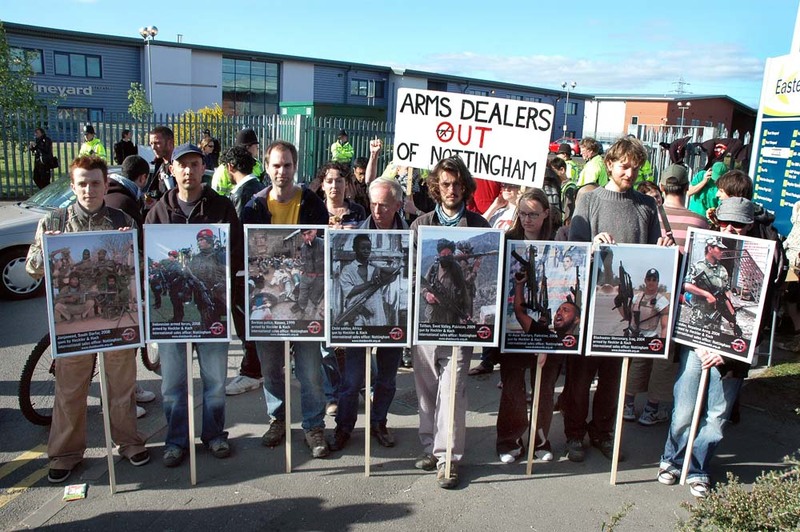 I am writing on behalf of Shut Down H&K – the campaign against Heckler & Koch, the arms company whose warehouse is next to Trent Vineyard at Unit 3, Easter Park. On December 13th, three supporters of the campaign took some leaflets to inform churchgoers about the arms company. A member of church staff spoke to the leafleters and told them that the church’s HR/researcher had found inaccuracies the campaign’s literature. The inaccuracies in question were not discussed but the church representative said that you would be happy to be contacted regarding the specifics. The campaign against H&K strives for accuracy in all of its claims, relying only on authoritative sources and cross-checking its research with arms trade experts in the UK and Germany. If you have found any inaccuracies in our claims, we would very much appreciate you pointing them out to us so that we can correct them immediately. I appreciate that you are probably busy with church business, and that this may not be a priority for you. For easy reference I have attached a PDF of the leaflet that was handed out at Trent Vineyard in February and December of this year. I hope that it will help you if I run through the claims that the leaflet makes about H&K, and explain briefly our sources for each one. Heckler & Koch is the world’s 2nd-largest manufacturer of handguns, assault rifles, submachine guns, machine guns and grenade launchers. This is according to the FAQ on the website of the Small Arms Survey, a respected and authoritative research project based in Switzerland that serves as “the principal international source of public information on all aspects of small arms”. H&K’s rank may vary according to how it is calculated, but it is certain that H&K is one of the world’s top small arms brands. 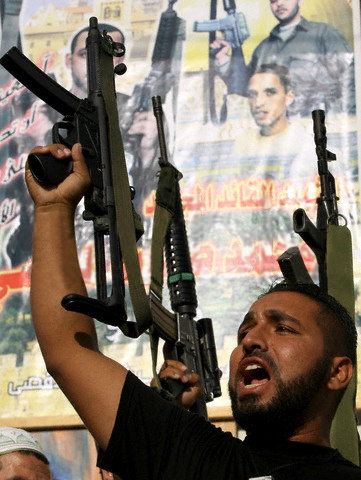 Millions of H&K weapons are in use in over 90 countries worldwide. According to Jürgen Grässlin, Germany’s foremost anti-arms-trade campaigner, there are currently around 10 million G3 rifles in circulation, which were made by H&K and its numerous licensees. 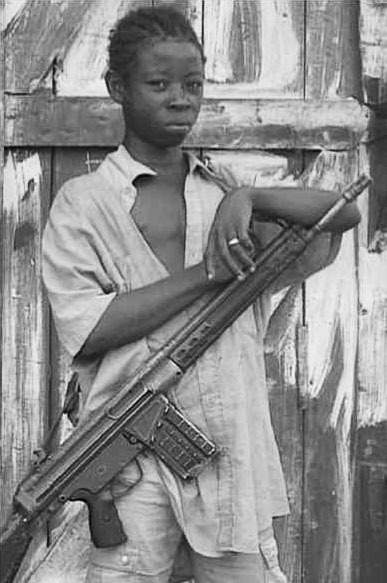 The Small Arms Survey’s 2001 report states that H&K weapons are used in over 90 countries worldwide [p. 20]. Heckler & Koch weapons have come to be used by repressive regimes, terrorists, armed gangs and child soldiers around the world. The Shut Down H&K campaign can provide many examples to back up this claim. To illustrate, I have attached the following four photographs. 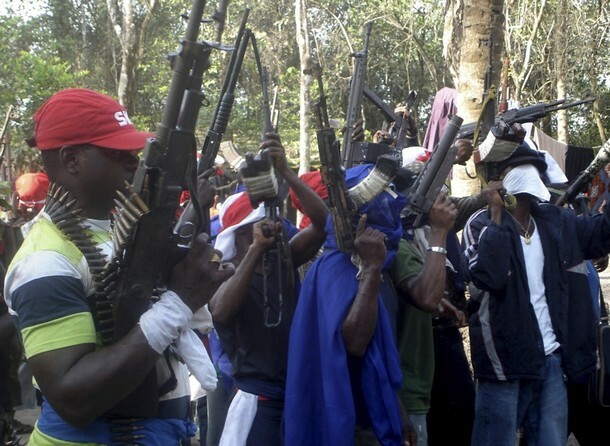 Heckler & Koch guns have caused an estimated 1.5 million deaths worldwide. This figure is from Jürgen Grässlin’s book Versteck dich, wenn sie schießen [pp. 353-357]. It is a conservative estimate based on figures from UNICEF and the ICRC. 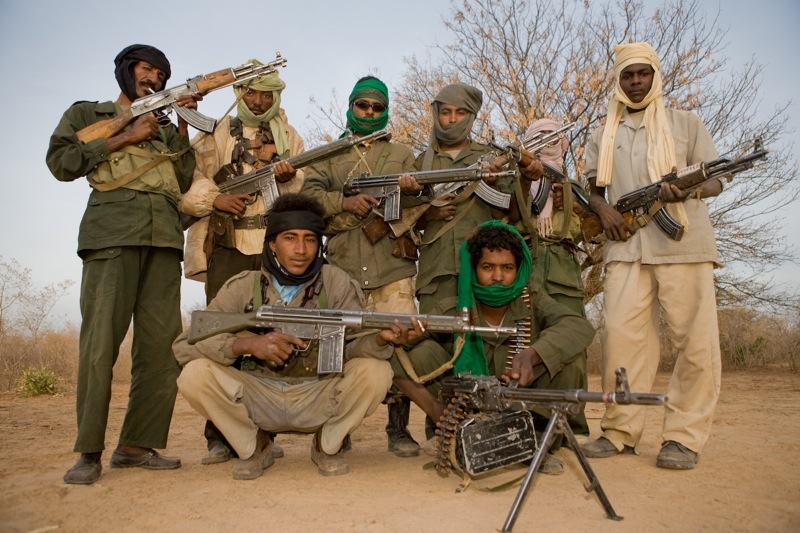 According to the June 2007 newsletter of DAKS, the German campaign against small arms, the International Criminal Court issued a warrant in May 2007 for the arrest of a Sudanese government minister for supplying the Janjaweed with G3 assault rifles. I have attached a photograph of Janjaweed fighters posing with G3s and AK-47s [by Andrew Carter, director of Channel 4 Unreported World documentary Meet The Janjaweed]. 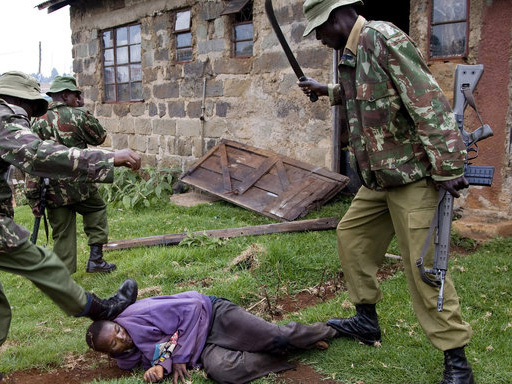 Kenya-based magazine The African Executive reported in its 6th Feb 2008 edition that “Many pictures from the fighting scenes carry the G3 assault-rifle of Heckler & Koch.” I have attached a photograph of a Kenyan policeman with a G3 rifle beating an unarmed man during the post-election unrest on 1st February 2008 [by Yasuyoshi Chiba, AFP/Getty Images]. In Kosovo, Serbian police used H&K guns to kill Albanian villagers. In Iraq, the notorious mercenary army Blackwater (which has shot and killed unarmed civilians) is using H&K machine guns. 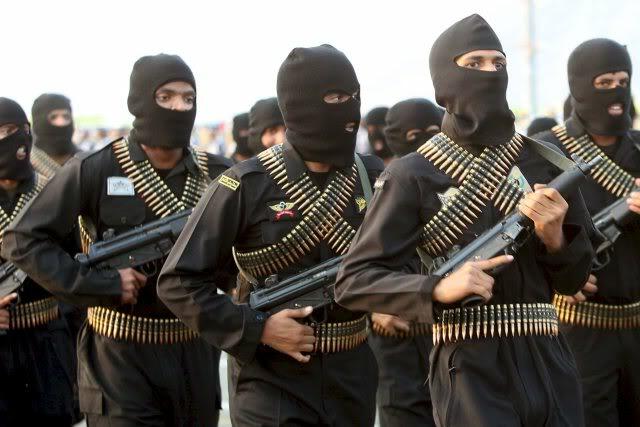 In October 2007 the Washington Post reported that “security contractors” employed by Blackwater had killed Iraqi civilians in several incidents including the September 16th slaying of 17 civilians in Baghdad. On 19th February 2008, on German TV, the Report Mainz current affairs show reported that Blackwater had been using Heckler & Koch machine guns in Iraq. In S. Ossetia, Georgian soldiers were illegally armed with H&K guns. If you would like more details about any of our sources, please get in touch. Please do let us know which of the campaign’s claims you believe to be inaccurate. We would be grateful if you could supply any relevant documentation that could help us to improve the accuracy of our publications. The campaign has heard from members of the Vineyard congregation that the church leadership has been in conversation with H&K. We sincerely hope that the church will not accept any reassurances from the arms company without independent verification. The campaign remains willing to meet with church representatives at the church’s convenience.